Duluth, Minn. (21 January 2016) – Cirrus Aircraft today announced the debut of their latest innovation in flight training – the Interactive Flight Operations Manual (iFOM). The iFOM is a multi-touch iBook designed for use on the iPhone, iPad and Apple® computer platforms, providing pilots personalized mobile access to SR20, SR22 and SR22T flight procedures, standards and techniques. This brand new training resource is designed to complement Cirrus Aircraft’s popular Cirrus Approach™ online learning program by delivering engaging content with the primary goal of furthering our longstanding mission of creating safe, knowledgeable and proficient Cirrus pilots. 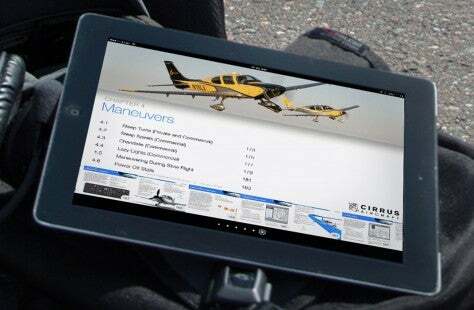 The iFOM was developed as an electronic, interactive version of the Cirrus Flight Operations Manual (FOM) and operates like a standard iBook with an introduction including demonstration videos and easy, step by step tutorials. The entire iFOM features 21 videos, 34 interactive modules, in-text hyperlinks to pertinent charts and data, easy-to-navigate chapters and expanded descriptions for all standard and most emergency procedures. Created to be the ultimate airplane reference for procedural flying, it contains everything a pilot needs at his or her fingertips, navigated by simple pinch, touch and swipe gestures. Information such as diagramed flight profiles, maneuver outlines and checklist descriptions are easily accessible, and pilots are able to create personalized study cards or to test their knowledge about pre-flight flow patterns. To insure pilots have the most current procedures, the iFOM also updates automatically, similar to applications on the iTunes App Store. The Cirrus Approach training system leverages modern eLearning technologies to prepare pilots for training before they enter either ground school or an aircraft and enhances recurrent training as well. A number of online courses are available on the Cirrus Approach Learning Portal. This portal guides pilots through their training and allows for effective learning along with the ability to proficiently reference information on a daily basis. Cirrus encourages every pilot to enroll in the Cirrus Approach program to get the most out of their training and aviation experience. Team members at Cirrus work to continuously test and publish improvements to procedures and techniques, so pilots are always up-to-date on the safest flying methods. The Cirrus Approach learning system, along with the introduction of the new iFOM, continue to place Cirrus Aircraft at the forefront and leading edge of flight training. The iFOM is available on iTunes and for purchase everywhere iBooks is available. Cirrus Aircraft is a recognized leader in general aviation. Its all-composite line of personal aircraft – the SR20, SR22 and the turbocharged SR22T – incorporate innovative and advanced performance, electronic and safety technologies, including Cirrus Perspective™ by Garmin® avionics and the unique Cirrus Airframe Parachute System® (CAPS®). To date, total time on the worldwide Cirrus Aircraft SR-series fleet surpassed seven million flight hours with 120 people returned to their families as a direct result of CAPS being a standard safety feature on all Cirrus aircraft. The Cirrus Vision Jet, with over 550 production positions reserved, will provide a new personal and regional business transportation solution: the personal jet. The Vision Center in Knoxville, TN will be the flagship location for all Cirrus Aircraft Customer Experience activities including sales, delivery, training, maintenance, support, personalization, fixed base operations and more. All Cirrus aircraft are made in the U.S. with a direct sales force in North America and authorized sales centers covering export markets in 60 countries around the world. Cirrus Aircraft is wholly owned by China Aviation Industry General Aircraft Co., Ltd (CAIGA). For additional information on Cirrus and its products please visit cirrusaircraft.com. Referenced Cirrus trademarks are owned by Cirrus Industries, Inc. or its subsidiaries. All other brands, product names, company names, trademarks and service marks are the properties of their respective owners. All rights reserved. Does this include the standard ops for G3 TAT aircraft? Good question. It applies to all Cirrus aircraft with Perspective avionics. G3 had some with, and some without- so it depends upon your specific aircraft. This will be extremely useful. WOW!!! I’m very excited. This new technology is a game changer and a much better way to learn. I’m looking forward to it. Cirrus Continues to deliver the exceptional support and products that make this company the benchmark of General Aviation!! This is just one more example of using today’s interactive technology that makes Cirrus the safest Aircraft available today. Well done!!!! Thank you. We are looking into Android capabilities, so stay tuned. Thanks for the inquiry! Is it compatible with and useful for a 2004 SR20 with Avidyne Entegra and Garmin avionics? Good question. The iFOM was written to be compatible with Perspective avionics, but there are some concepts that apply to other platforms as well. But what about the loyal Cirrus owners out there with the Avidyne/Garmin 430 avionics package? Will you release a version of the iFOM for us? Absolutely! We have this in the works and plan to release it later this year! Thanks for asking. Is this new ifom cover IFR capabilities or is it only geared for VFR Ops? It does, indeed, cover IFR. Thanks for the question! Any update on the Android version availability? Great app ! good information for cirrus pilots!